Proposition B, otherwise known as Raise Up Missouri, was certified on November 6, 2018. The ballot initiative changed Missouri’s minimum wage from $7.85 to $8.60, and it is set to increase gradually each year until it reaches $12 in 2023. A group calling for a higher minimum wage has turned in signatures for a ballot initiative that would let voters decide the issue. St. Louis' city minimum wage could rise to $10 an hour starting next week now that the state's highest court won't reconsider its ruling upholding it. The Missouri Supreme Court in February rejected claims by business groups that setting a wage higher than the state's $7.65 one would spawn regulatory confusion. The St. Louis Post-Dispatch reports the Supreme Court on Tuesday refused to revisit that, ending the issue. The ordinance sets a $10-an-hour minimum wage in the city this year, climbing to $11 in 2018. Kansas City residents will vote in August on whether to raise the city's minimum wage to $15 an hour. The Kansas City Council agreed Thursday to comply with a Missouri Supreme Court order and put the petition initiative on the Aug. 8 ballot. The Kansas City Star reports the proposal would increase the current $7.70 minimum wage to $10 per hour by Sept. 1 and gradually to $15 per hour by 2022. 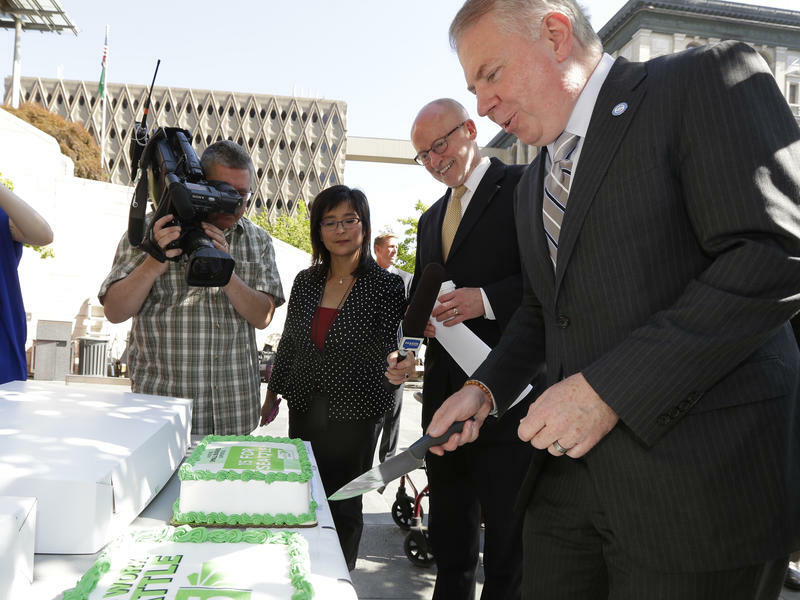 The initiative is backed by civil rights activists, urban core ministers and other social justice advocates. Striking workers are protesting in Kansas City for a higher minimum wage as part of rallies nationwide. The Kansas City Star reports that dozens marched around a McDonald's restaurant shortly before 6 a.m. Tuesday before heading to a Burger King restaurant. The rally participants included the Rev. Donna Simon, of St. Mark Hope and Peace. She says that no one can live on $15,000 a year. 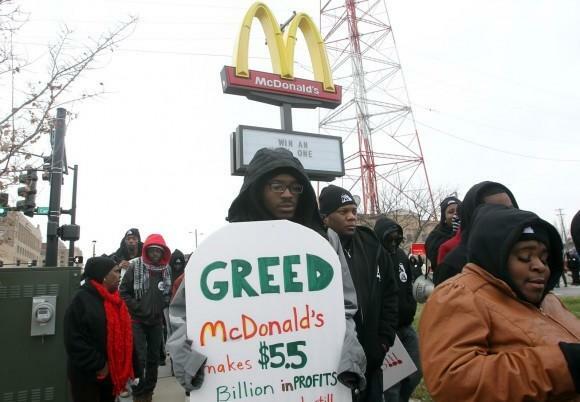 The rallies in Kansas City and elsewhere commemorate the day four years ago that the Fight for $15 movement began in New York City when a group of fast-food workers walked off the job. Kansas City civic and business leaders say a Missouri lawmaker's effort to eliminate the city's earning tax would decimate the city's budget if it succeeds. A judge is weighing a business-backed lawsuit's bid to stop the city of St. Louis from gradually raising its minimum wage. A proposal that called for Kansas City's minimum wage to increase to $15 per hour won't appear on the November ballot. St. Louis' top elected officials are discussing whether to purchase body cameras for the city's police force, but finding money for the technology that's estimated to cost up to $2 million appears elusive. The St. Louis Post-Dispatch reports that no action was taken on the issue at the Thursday meeting of the three-member Board of Estimate and Apportionment. Stephens College has raised its full-time employee minimum wage to $10 per hour. The change became effective with the start of the school's fiscal year on July 1. Employees mainly affected by the shift are in service or maintenance roles, including those who clean, take care of the grounds, handle recycling and trash pickup. The Kansas City Council has agreed to put a citizen group's minimum wage petition on the November ballot. A group of business associations has started a petition drive to try to force a referendum election aimed at overturning Kansas City's new minimum wage law. The Kansas City Star reports the group has until Aug. 25 to gather about 3,400 signatures to challenge the measure recently approved by the City Council. The measure raises Kansas City's minimum wage from $7.65 per hour to $8.50 per hour on Aug. 24, with annual increases to $13 per hour by 2020. Those for and against Missouri cities setting higher local minimum wages are at odds over whether such ordinances are allowed under current law. A Missouri bill meant to block cities from raising the minimum wage or banning use of plastic bags has been vetoed. Democratic Gov. Jay Nixon vetoed the bill Friday, saying it infringed on local control. The bill would have stopped cities from enacting a higher minimum wage than the state minimum. It also would have prevented local ordinances to ban the use of plastic grocery bags. Kansas City and St. Louis officials are considering raising the minimum wage. Columbia had discussed banning store use of plastic bags, but later dropped the proposal. Kansas City officials are nearing their self-imposed mid-July deadline for coming up with a plan to raise the local minimum wage, but so far there is no consensus on what needs to be done. The effort to raise the minimum wage to $15 an hour in St. Louis is in jeopardy after the chairman of the committee that would consider the idea canceled all future hearings on it. 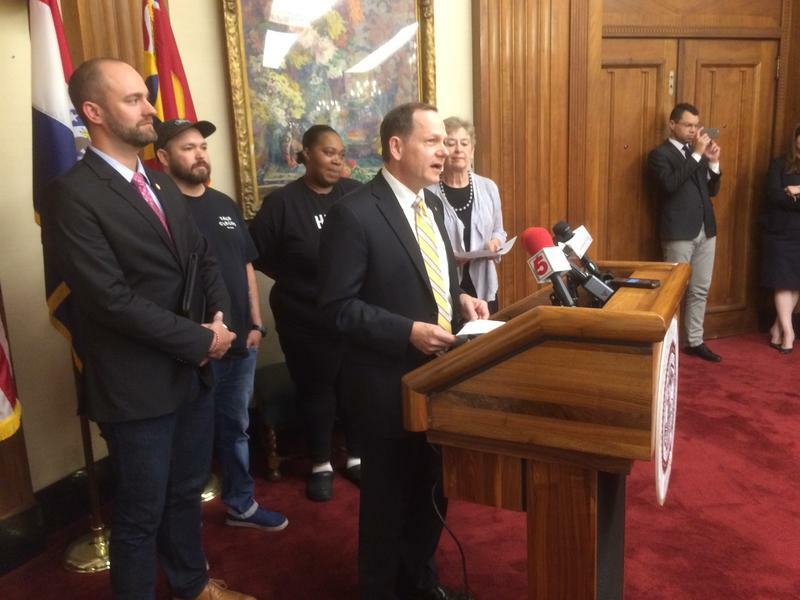 A measure filed this month with support of Mayor Francis Slay would have potentially raised the wage in the city to $15 by 2020. But the St. Louis Post-Dispatch reports that Alderman Joe Vaccaro, acting chairman of the Ways and Means Committee, canceled all hearings, calling it disingenuous to push the bill on such short notice. St. Louis’ political leadership will make a quick attempt to raise the city’s minimum wage, a public policy initiative they contend is economically and morally just. But whether the city possesses the authority to raise its minimum wage is something of a moving target – and could depend on whether a bill that many Democrats despise is enacted into law. Three initiative petitions to increase Missouri's minimum wage have been approved for circulation. Missouri’s General Assembly has passed legislation that would limit city governments from passing certain policies. Restaurant servers are three times more likely to receive below-poverty-line pay than the rest of the U.S. workforce. Yet in a world where shoppers fret over cage-free eggs and organic vegetables, how many are also asking how much their favorite restaurant pays its staff? A Missouri Republican wants to ban local laws that raise the minimum wage, require employers to offer paid sick leave or other benefits or prohibit employers from asking about criminal convictions early in the job application process. Rep. Caleb Rowden, of Columbia, introduced a bill Thursday that he said will ensure businesses don't have to deal with confusing and complex regulations that vary across the state. Minimum Wage Goes Up In Missouri. But Is It Too Much Or Not Enough? Missouri’s minimum wage will go up 15 cents as of New Year’s Day. The increase from the current $7.50 to $7.65 is the result of a 2006 ballot referendum tying the state’s minimum wage to the Midwest Consumer Price Index. It’s the second 15 cent increase in as many years. New data released by the Department of Labor shows that raising the minimum wage in some states does not appear to have had a negative impact on job growth, contrary to what critics said would happen. In a report on Friday, the 13 states that raised their minimum wages on Jan. 1 have added jobs at a faster pace than those that did not. The data run counter to a Congressional Budget Office report in February that said raising the minimum wage to $10.10 an hour, as the White House supports, could cost as many as 500,000 jobs. A state Senate committee has advanced legislation that could raise Missouri's minimum wage to $10 an hour. Wages will rise for Missouri's low-income workers and taxes will fall for some corporations when the new year arrives. Missouri's minimum wage will increase for about 100,000 workers from $7.35 an hour to $7.50. The increase is a result of an annual inflationary adjustment included in a law passed by voters in 2006. 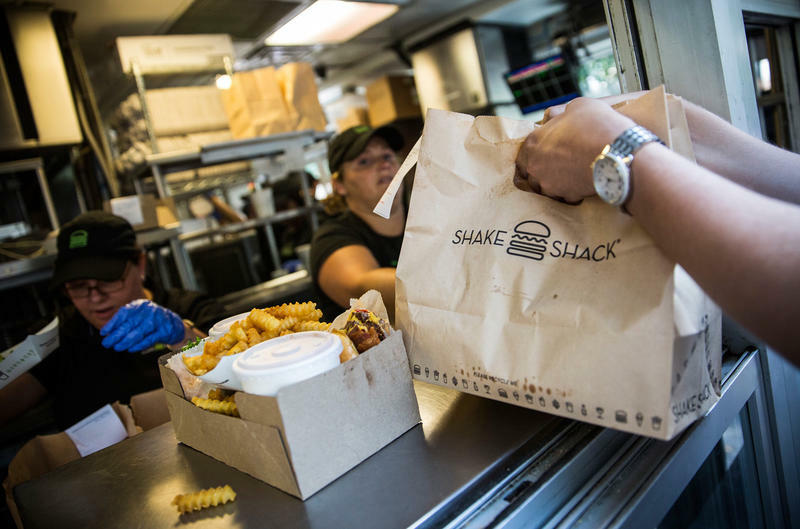 The state's corporate franchise tax rate also will ratchet down in 2014. That's the result of a 2011 law passed by legislators that gradually phases out the franchise tax by 2016. Protestors took the sidewalk on Thursday demanding higher wages and the ability to form a union for the 2300 Fast-food workers in Columbia. In more than 100 cities across the country, protests brought together various industry workers asking for a higher, more livable wage and the ability to form unions. Passersby honk as a group of protestors chant "We cannot survive on $7.35" in front of the Burger King on Business Loop-70 in Columbia. Standing in 20 degree weather, the protestors demand higher wages and the ability to form a union. Missouri's minimum wage will rise by 15 cents an hour in January. "Can't survive on $7.35 -- can't survive on $7.35."